With Thanksgiving still three weeks away, taxes are probably the last thing on your mind. 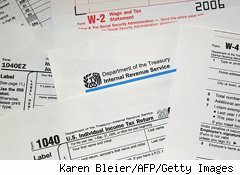 Still, much as you might groan at the thought, there are some smart steps you can take between now and Dec. 31 that will make a real difference when it comes time to deal with the IRS next spring. In part one of this two-part report, we offer four moves that could benefit your bottom line on April 15. If you have enough in cash savings set aside for emergencies and your monthly budget allows for it, consider upping your 401(k) contribution. You're allowed to contribute up to $16,500 of your earnings tax free (in addition to any company matching), and that limit gets bumped to $22,000 if you're over 50. If you don't have a 401(k) at work, consider setting up an IRA or Roth IRA, recommends Charles Sizemore, editor of the Sizemore Investment Letter. If you're self-employed and have the cash flow to allow it, you can shelter as much as $49,000 per year in a SEP-IRA. The more money you put into these retirement funds, the less you pay in taxes now -- and the more you earn for golden years. Taxes are like sandpaper that grinds down your returns over time, says Sizemore: Every dollar you pay in taxes today is a dollar that can't be invested for growth. There are also secondary benefits, such as protection from creditors. In most cases, assets held in a 401(k) or IRA are safe from creditors' claims. Clean out your closets, garage, attic and spare rooms, and donate clothing and household goods you no longer use to your favorite charity. The IRS allows a deduction for the fair market value of all non-cash contributions that are in good condition. If you're planning on a larger than normal contribution to your favorite charity, do it before Dec. 31 to lower your taxes this year, says Mark Steber, chief tax officer with Jackson Hewitt Tax Service. Be sure to get a receipt from the recipient organization and keep it with your tax records. Also, if you're giving away an item worth more than $5,000, you'll need a qualified appraisal with your tax return. Know too, that if you offer up your stuff to a for-profit resale store or if you sell it on a consignment basis, and you get a percentage of the sale, the IRS won't allow that as a deduction. Each year, you can give up to $13,000 each to an unlimited number of people without any gift tax or estate tax ramifications. And if you have the funds, consider making large gifts to utilize the new $5 million per person lifetime gift exemption. Under the 2010 Tax Relief Act, that exemption and a 35% tax rate are in place in 2011 and 2012, but are scheduled to adjust to $1 million and a 55% rate in 2013, says Miguel Farra, principal-in-charge of the Tax and Accounting Department at CPA and advisory firm Morrison, Brown, Argiz & Farra. If you choose to give your money to a charity, do your homework. Beware of scammers with names similar to legit organizations. A good place to start your research is www.give.org, www.charitynavigator.org and www.guidestar.org. Seniors can reap tax benefits even without itemizing. A little-known tax planning tip involves charitable contributions for people over 70½ years old. Many senior citizens have no mortgage interest to pay and don't have enough deductions to itemize. So typically, they would receive no tax benefit from their charitable contributions. However, those over 70½ years old can direct part or all of their required minimum IRA distribution (up to $100,000) directly to a charity tax-free. Even though they aren't itemizing their deductions, they'll reap the tax benefit of not reporting the donated distribution as income, says Joseph Arena, director of tax and business services for Brighton Securities. Coming next week: Four more easy ways to make tax time in 2012 less painful.